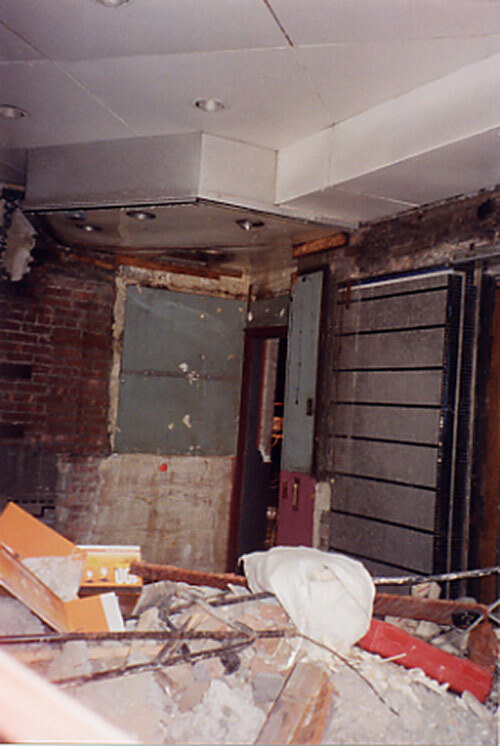 I’m sending you some “before” & “after” photos, indicating the state of the theater, as to when it closed on Dec 31, 1999, & current photos showing how much has been demolished/altered as of Aug 10, 2005. Hats off to Michael Perlman for taking on the important role of Trylon preservation advocate. This theater, a lovely example of 1939 World’s Fair style, shares this heritage with the magnificently maintained Senator in Baltimore and Riviera in Charleston. It’s a shame that in this nation’s greatest city there could be no action over the past four years to prevent the destruction we’re witnessing now. Unfortunately, the damge appears to have already been done. What a travesty! When was the last time the Trylon looked to still be in fairly good condition compared to now? The mural of the woman is very unusual. Where was it located in the lobby as I didn’t see it in the before photos to compare? Alot of time has elapsed from 1999 to 2005…time enough for much deterioration to occur due to the natural elements and due to man! 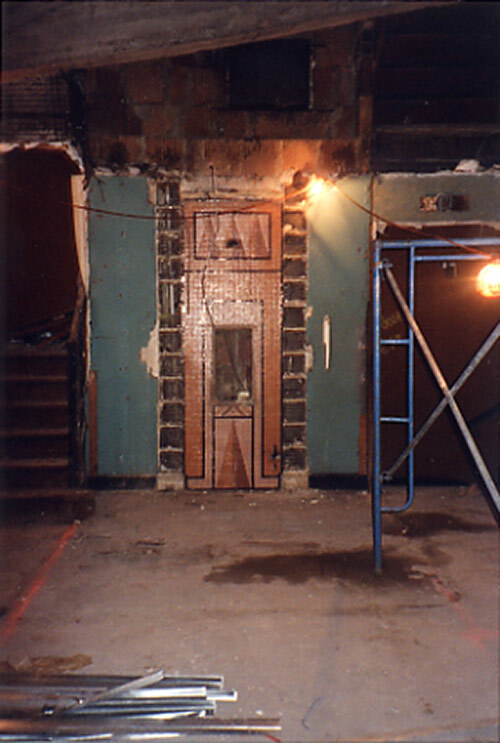 The hand-painted cloth murals were located on both sides of the Trylon Theater’s stage. 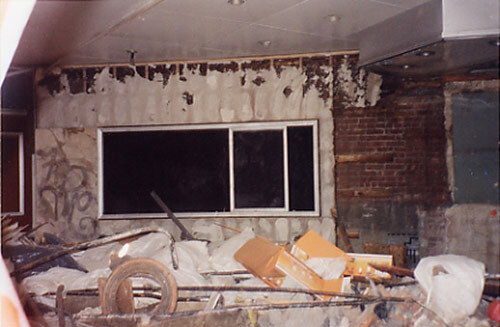 Holes were puched through murals! Councilwoman Melinda Katz said that many of the theater’s historical features would be donated to museums & historical societies, but no institution or society that I’m working with received anything. 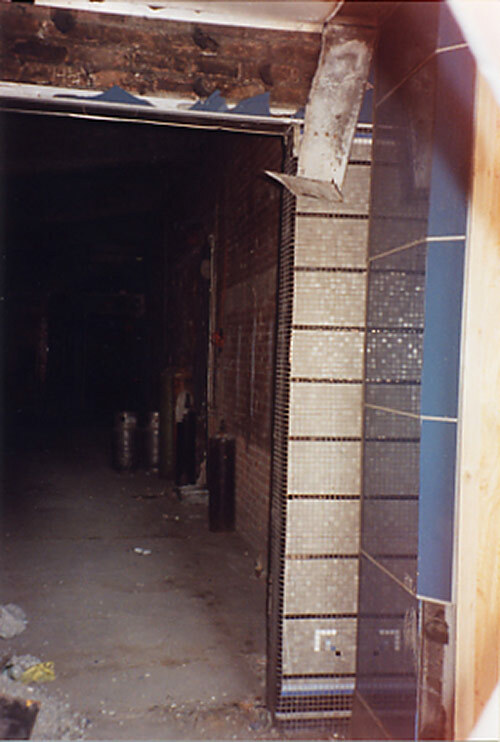 The theater’s inlaid mosaic tiles could have at least been salvaged or donated to a local museum as well. 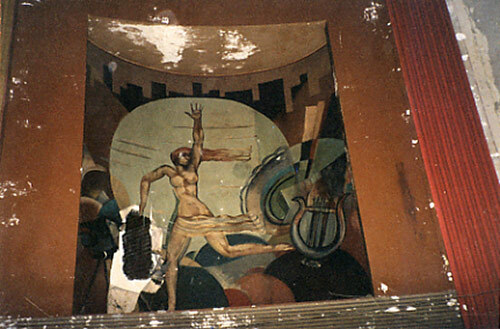 Getting back to the murals, triumphant figures were hand-painted, to illustrate the theme of the 1939 World’s Fair, “The World of Tomorrow.” Exhibits were intended to emphasize how technology would improve life for all cultures in years to come. It totally did NOT predict vandalism of artwork, committed by the workers at the site! Destruction of something iconic as this is an outcry for preservationists, & all concerned residents, & “crimes against culture (20th century heritage) certainly wasn’t a prediction either. 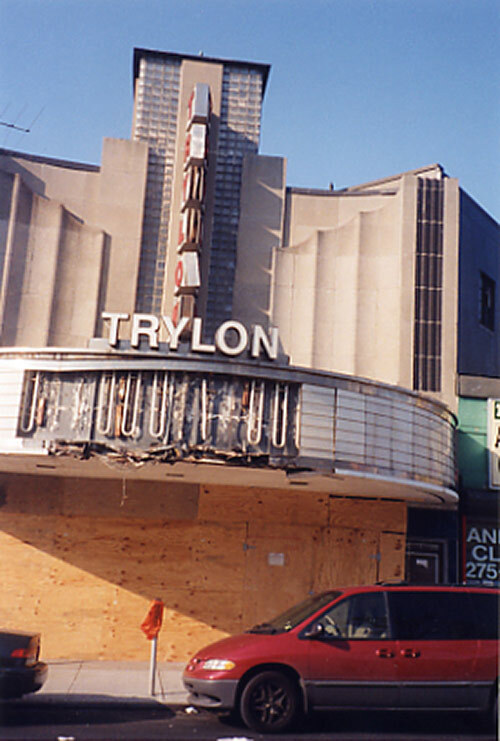 Come to the RALLY TO SAVE & LANDMARK THE TRYLON THEATER on Sunday, October 23rd from 2 PM to 3 PM. It will be at 98-81 Queens Blvd, Forest Hills. Compared to now, the Trylon was fairly intact when it closed in 1999. A preservation-minded re-se strategy can be achieved, & we’re confident that the site can be adapted for the Educational Center For Russian Jewry, the current owner! I was one of the managers here in the 90’s, this is very sad. I loved this place. Hi mns2lv4ever! Welcome to Cinema Treasures. I would like to communicate with you via e-mail. 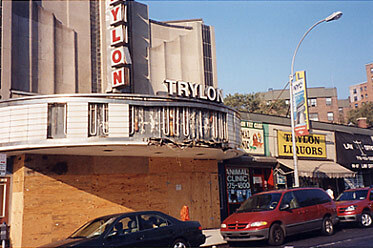 I knew just about every manager at the Trylon Theater from the 80’s until it closed its doors in 1999. I knew Mary, Elizabeth, Marie, Julie, etc. Maybe I knew you. Yes, the recent turn of events is a shame. I coordinated The Committee To Save The Trylon Theater to try to have it landmarked & preserve what’s remaining.